The global economy is continuing to perform strongly, with growth stabilizing at levels last seen more than two years ago in Q3. According to estimates by FocusEconomics, the global economy expanded 3.2% annually in Q3, matching the result in Q2. Q3’s reading mostly reflected improving economic dynamics in emerging-market economies such as Brazil and Russia, while developed nations continued expanding healthily on the back of rising real wages due to low inflation and largely accommodative monetary policies. While the global economy appears to be in a sweet spot, political developments are gradually taking center stage, threatening to undermine the current economic momentum. The fourth round of the North American Free Trade Agreement (NAFTA) negotiations ended on 17 October without a conclusive result. Canada and Mexico rejected proposals from the U.S. of increasing protectionism. Despite their opposition to U.S. demands, Canada and Mexico did not walk away, and a fifth round of talks will start in mid-November. U.S. President Donald Trump has stated that the U.S. will withdraw from the 23-year old deal if the countries cannot strike a deal to reshape it. The withdrawal of the U.S. from the trade deal will likely imply an increase in trade barriers in the continent, which would certainly have negative spillovers for the global economy. In Europe, while negotiations between the European Union and the United Kingdom did not break down in recent weeks, they have been shunted into the sidelines. Instead of focusing on their future trade agreements, both parties are getting stuck on other issues, such as the rights of EU citizens in Britain and the future of the Northern Irish border. All sides expect to reach an agreement before the 14–15 December European Council meeting, in order to move to the next round of the negotiations. A further delay in the negotiations will increase uncertainty about the Brexit deal, threatening to derail Europe’s ongoing growth momentum. In Asia, the 19th National Congress of the Communist Party of China (CPC) held in Beijing on 18–24 October and the 22 October general elections in Japan allowed the leaders of China and Japan, respectively, to consolidate power. In China, Xi Jinping was reappointed as General Secretary of the CPC; he was also able to place more loyalists into the party’s top political bodies. As a result, Xi has amassed an amount of power unprecedented in China’s recent history, allowing him to comfortably implement his vision for the country: a more dominant role for China in the global arena and healthier economic growth based on consumption and services. More importantly, he did not signal any candidate to replace him once his second term expires in 2022, suggesting that he could opt for an unusual third mandate. In Japan, Prime Minister Shinzo Abe’s landslide victory will allow him to continue with his set of policies aimed at pulling the country out from years of sticky deflationary pressures and ensuring a more sustainable long-term growth. Moreover, the voters’ strong mandate paves the way for Abe to rewrite the country’s pacifist constitution and embolden Japan’s military capabilities, threatening to increase political instability in the region. Next year, developing economies are expected to lead global growth as higher commodity prices and improving fiscal positions will buttress their growth. In particular, the consolidation of the economic recoveries in Brazil and Russia will shore up economic activity in their regions. Analysts expect the global economy to grow 3.2% in 2018, which is unchanged from last month’s estimate. In 2019, poor dynamics among advances economies due to higher inflation and less accommodative monetary policies will drive the global economy to decelerate slightly to a 3.1% increase. The stable global economic forecast for 2018 reflected unchanged projections for Canada and the United Kingdom. Panelist revised upward their projections for Brazil, China, the Euro area, Japan, Russia and the United States. Conversely, India experienced a downgrade. Leading data suggests economic momentum persisted in Q3 in spite of hurricane-related setbacks. Retail sales rebounded strongly in September as reconstruction efforts boosted sales of vehicles and building supplies, while industrial production returned to growth following two months of contractions. In addition, although employment growth slumped at the end of the quarter on hurricane-linked transitory weaknesses, the unemployment rate dropped to a 16-year low and average earnings growth picked up markedly, which will provide strong support to consumer spending throughout the rest of the year. In the political arena, both the House and Senate made progress in recent weeks towards passing tax reform without support from Democrats. Meanwhile, the fourth round of NAFTA talks drew to a close in mid-October as the parties struggled to reach consensus on contentious topics. In light of existing difficulties, officials have agreed to extend talks into the first quarter of 2018. Economic growth is expected to accelerate slightly next year as a tight labor market continues to buttress household spending and modest tax reform seems increasingly plausible, invigorating non-residential fixed investment and business sentiment. The FocusEconomics panel expects growth to reach 2.4% next year, which is up 0.1 percentage points from last month’s estimate. In 2019, growth momentum is expected to begin petering out, with our panel foreseeing GDP growth of 2.0%. Incoming data suggests that the Eurozone’s economy continued to fire on all fronts in the third quarter of 2017. Industrial production surged in August, and economic sentiment jumped to an over 10-year high in September. In addition, the unemployment rate hovered at a multi-year low in August and robust external demand has boosted exports, despite a strong euro. All-in-all the economy is on track to record the fastest annual growth since before the financial crisis. On the political front, the situation has become more turbulent in recent weeks, which could increase uncertainty in the region. In Spain, an independence movement in Catalonia has led to clashes between regional authorities and the central government. Escalating tensions along with public demonstrations could take a toll on economic activity in the region in the coming weeks. Meanwhile, Austria shifted to the right in its 15 October elections, and Brexit negotiations have yielded little progress so far. FocusEconomics analysts expect the Eurozone to grow a healthy 1.9% in 2018, which is up 0.1 percentage points from last month’s estimate. A stronger labor market should support robust growth as the common-currency bloc puts the crisis behind it. However, slower exports growth should take a bite out of the momentum. In 2019, GDP is seen expanding 1.6%. Prime Minister Shinzo Abe managed to uphold his two-thirds supermajority in the 22 October snap election. Abe’s strong mandate paves the way for him to revise the country’s pacifist constitution, and he is on track to becoming the longest-serving prime minister in Japan’s history. Abe’s intention to adopt a more assertive approach to foreign policy, in particular with North Korea, threatens to add more fuel to an already strained region. On the economic side, Abe will continue with the implementation of his set of policies aimed at boosting Japan’s inflation and long-term growth, dubbed Abenomics, and will likely reappoint Bank of Japan governor Haruhiko Kuroda next April; he also plans on moving ahead with the implementation of a controversial sales tax hike in 2019. Abe will start his third consecutive term with an economy performing well on the back of healthy external demand and improving domestic activity. Next year, growth will decelerate somewhat as the tailwinds that propelled the economy this year fade away. Moreover, persistent geopolitical tensions could add upward pressure on the safe-haven yen, hurting the all-important external sector. 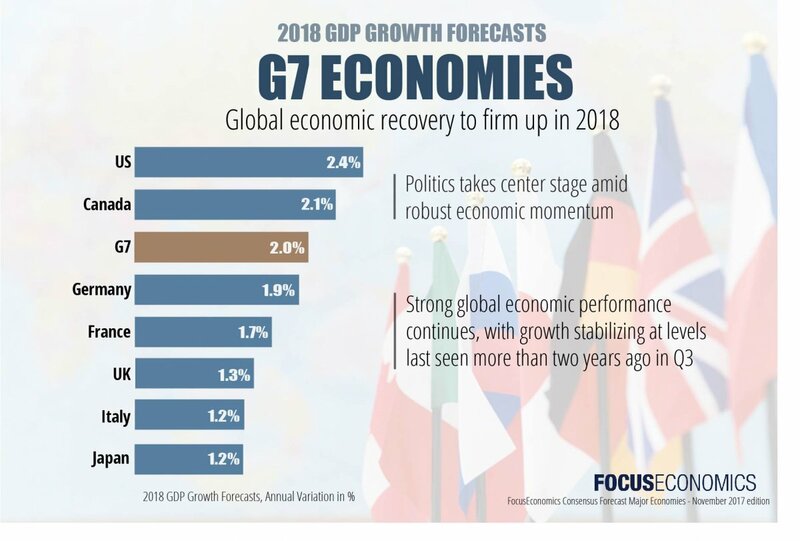 FocusEconomics panelists see the economy growing 1.2% in 2018, which is up 0.1 percentage points from last month’s forecast. For 2019, they see growth at 1.0%. The economy continues to chug along, with both the manufacturing and services PMIs staying well in expansionary territory in September, and the unemployment rate at a multi-decade low. However, consumers are still smarting as higher inflation digs ever deeper into real wages, evidenced by disappointing retail sales in September. In order to boost the purchasing power of young people, the government recently promised GBP 10 billion to help them purchase a home, and announced a more generous system of tuition fee repayments. Clarity over how these new spending measures will be funded should come in November’s budget. On the international front, Brexit negotiations are at an impasse. In September, Prime Minister Theresa May outlined proposals for a two-year transition period, during which time the UK would enjoy unfettered access to the single market. However, talks on such a transition deal are yet to begin, with both sides still locking horns over a financial settlement. The longer the preliminaries drag on, the thicker the fog of uncertainty becomes, with consequent risks to investment. Growth is likely to slow next year, with fixed investment paralyzed by the ever more pervasive uncertainty generated by Brexit. However, a stronger external sector and resilient global demand should cushion the slowdown. Our panelists estimate GDP growth of 1.3% in 2018, which is unchanged from last month’s forecast, and 1.5% in 2019. Global inflation came in at 3.3% in September according to an estimate from FocusEconomics, unchanged from the previous month’s reading. The print reflected higher inflationary pressures among most developed economies as a result of a surge in commodity prices, particularly for energy. The hurricane season in the United States also contributed to the increase in prices as disruptions in refineries shot up prices for gasoline. Higher prices in advanced economies were offset by lower inflation in emerging markets due to less expensive food and more stable currencies. Higher commodity prices and stronger global growth are expected to drive global inflation in 2018 to levels last seen nearly two decades ago. That said, hyperinflation in Venezuela represents a big share of the expected reading for next year. The FocusEconomics panel projects that global inflation will rise to 5.5% in 2018, which is up 0.8 percentage points from last month’s forecast. In 2019, analysts see global inflation moderating to 4.3% mostly due to improving macroeconomic imbalances in emerging-market nations.